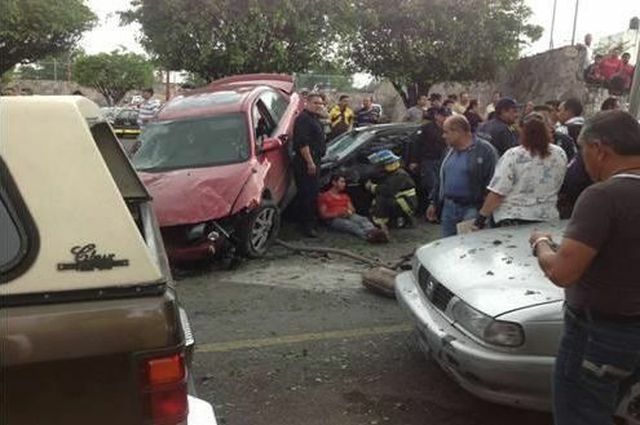 An inebriated driver hit five vehicles parked outside a municipal police station in Guadalajara on Friday, just minutes after running over a motorcyclist in Tonala. Jose Carlos Perez Tapia, 26, was arrested and treated at a Green Cross facility after his destructive, alcohol-fueled escapade came to a sudden end. It had begun when Perez, a Tonala resident, hit a motorcyclist on the Periferico beltway, leaving the victim injured and the motorbike lodged beneath his red Mazda. Perez fled the scene, dragging the motorbike for seven kilometers while Tonala police officers took up pursuit. Perez eventually lost control of his vehicle and slammed into five parked cars just outside the Santa Cecilia police station on Avenida Juan Pablo II. Two of the parked vehicles – most of which belonged to police officers – were written off while the others suffered serious damage.